‘Theophrastus’ is intended for all members of the scientific and educational communities, especially scientists in the field of forest ecosystems, and anyone searching for material related to Forestry and the Natural Environment. 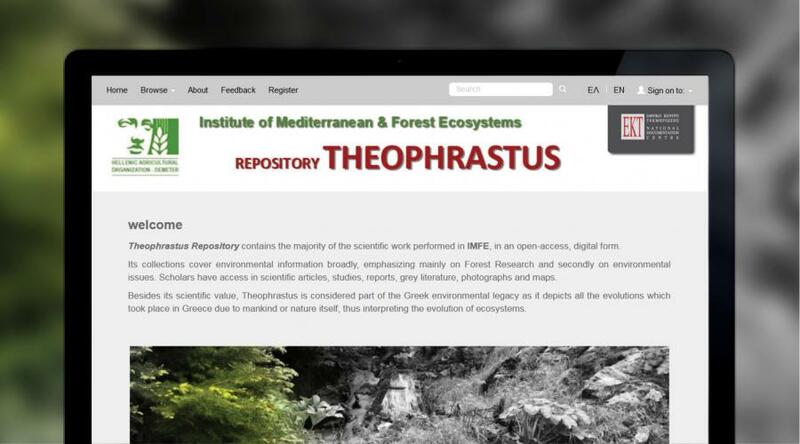 The scientific content of the Institute of Mediterranean & Forest Ecosystems, (IMFE) one of the oldest research institutes in the country with 90 years’ experience, is now available through EKT’s infrastructure for repositories. The Theophrastus Repository provides open access to the research and scientific work of the Institute, and is organised to reflect the diversity of its rich content. The collections of the repository include articles, studies, theses, maps, videos and recordings, which together capture all the man-made and natural processes affecting the evolution of Greece’s forest ecosystem. The content highlights the most important work of the institute in improving the competitiveness of the forestry sector through sustainable management of the forest ecosystem, maintaining and enriching the biological diversity, vitality and health of the forest ecosystems. One of the goals of the repository is the further dissemination and exploitation of the environmental information available at IMFE. For that reason, the repository includes a thesaurus of specialist forestry and environmental terms, content distribution licences, advanced search and navigation services, as well as offering users extra features such as the export of bibliographic reference, recommendation item, and sharing of social networks. ‘Theophrastus’ is intended for all members of the scientific and educational communities, especially scientists in the field of forest ecosystems, and anyone searching for material related to Forestry and the Natural Environment. Although only IMFE personnel have the right to deposit material (research and scientific) in the repository, registration and use is the right of all potential users. The main objective of the Institute of Mediterranean & Forest Ecosystems (IMFE) is to support forestry actions in Greece through research, technology development and technology transfer. EKT’s Repositories Service is designed for a wide range of scientific, cultural and educational organisations. The service enables content providers to organise, manage and make their digital content available via online repository platforms, according to international standards and using innovative tools cloud technologies and SaaS (Software as a Service) delivery models. The Repositories Service is a public service for the organisation, documentation and dissemination of digital content. The service is accompanied by a suite of complementary services covering design, support, training and guidance for editing content. Organisations that make use of these services showcase their digital content, and thus, increase their impact in Greece and abroad, while the public gain access to authoritative digital content, which can be used in research, education and lifelong learning.